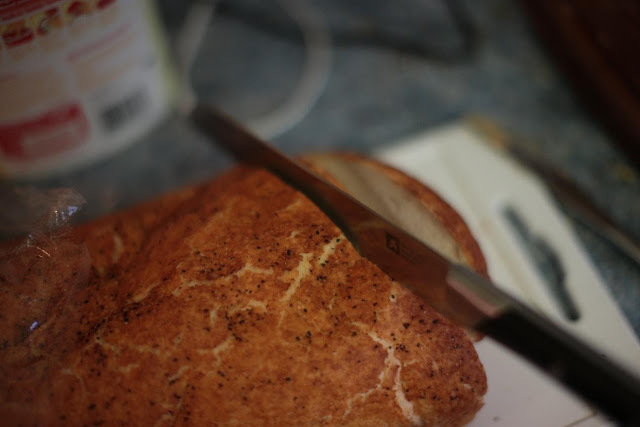 The problem with a nice fresh Salt & Pepper or Tiger loaf from Tesco is cutting it. It is so fresh and light that the bread knife squashes it flat. The pre-cut loaves are OK, but I prefer cutting my own fresh loaf of bread. 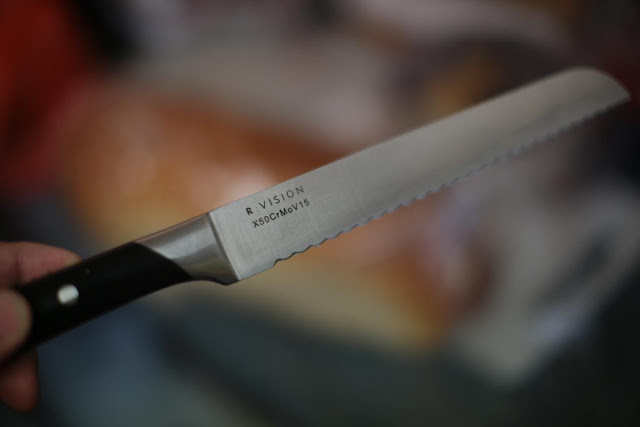 So I got a new bread knife today. Went in to Bentall's in what is left of Bracknell Town Centre. OK, this is like a hot knife through butter - serious bread knife. Even a fresh loaf does not get flattened by it. Well worth every penny of the £34 it cost. Even better, bake your own tiger bread, which is an ordinary white loaf dough spread with a rice flour paste which cracks as it bakes. Looks just as good but tastes 100 times better! I've been completely unsuccessful in my attempts to do tiger bread at home using rice flour... How do you make up the paste? Oh, and get a Spiderco Tri-angle Sharpmaker knife sharpener to keep your investment sharp enough to shave with. My doctor nagged the blazes out of me over White bread (I'm Insulin resistant). Has he never been past the bread counter early in the morning? I'm only human for god's sake & wholemeal bread tastes like cardboard! "The problem with a nice fresh Salt & Pepper or Tiger loaf from Tesco is cutting it." I'll go along with that. Bread really couldn't be easier to make and a simple loaf shouldn't need more than ten minutes of attention (slightly more if you knead it by hand). Not only does it taste better than the mass produced stuff but I get a good feeling of achievement for making something that's feeding my family. Oh my god it is happening, he is transitioning into an "Instagramist"! The best thing since sliced bread? A decent breadknife! And Marmite, of course. I think I may have to go and have a Marmite sandwich now... Wholemeal bread, of course. (Tastes like cardboard? Must be buying strange stuff - I Think it's delicious, and it does *taste*, unlike the white pap). While I'm here, why do Sainsbury's slice up the decent Wholemeal loaves they sell in the late afternoon? They are losing sales to people who won't buy sliced bread, and I can't see the point. Has someone told them that people shopping in the evening (ie people who have jobs) won't buy unsliced bread? I must send them a stroppygram about it.